Get your beer out of the way of your TV! It's football season, and that means beer and TV. Unfortunately, you never know what amazing play you'll miss during those few seconds when your glass blocks your view, so you'd better play it safe with the TV Beer Mug. Of course it's ridiculous and you shouldn't buy it (what else would you expect from a site called Perpetual Kid? ), but it's still clever enough for a laugh. Cheers! Fruits and vegetables often sell based on aesthetic appearance, leaving strange-looking but otherwise fine produce to go unsold. This is a part of the food waste problem, my favorite explanation of which (as usual) comes from John Oliver on Last Week Tonight. 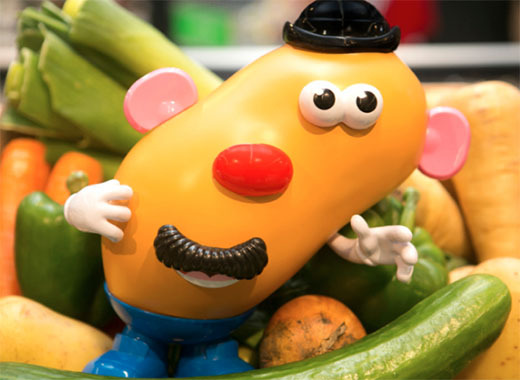 Unlikely hero Hasbro has stepped in with an asymmetric version of the classic Mr Potato Head, in a bid to win hearts and minds toward produce with a little wabi-sabi. I'm all for it, and believe that it's possible to appreciate aesthetic beauty where it's appropriate, but be wise enough to set it aside when it's not.